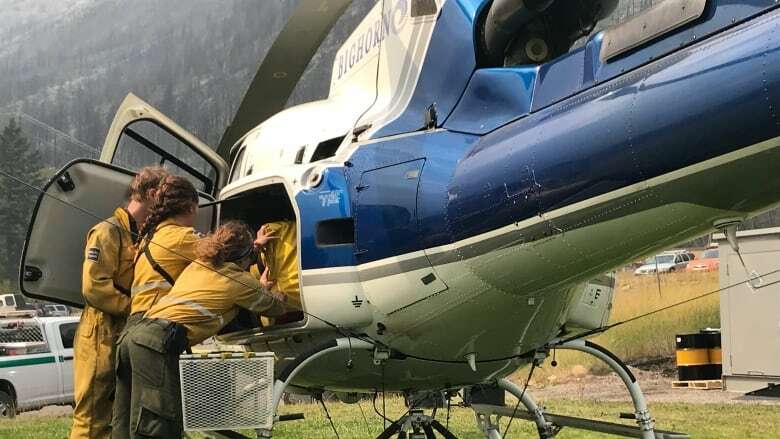 Parks Canada has sent a third helicopter to fight a 1,100-hectare wildfire burning south of Waterton Lakes National Park. Parks Canada has sent a third helicopter to fight an 1,100-hectare wildfire burning south of Waterton Lakes National Park. High winds and dry conditions were expected to lead to continued fire activity and smoke Saturday, Parks Canada said, and small amounts of precipitation in the early morning hours did nothing to suppress the blaze. Hot spots were observed on the east perimeter of the wildfire during a reconnaissance flight at 8 a.m., Parks spokesperson John Stoesser said in an emailed release. Two helicopters have already been bucketing water on those hot spots with the objective of holding the wildfire at an avalanche path which provides a natural firebreak in Montana's Boundary Valley. Parks Canada also has an initial attack crew — which can range from three to six firefighters — and an incident management team working on the fire, while the U.S. incident management team is deploying heavy helicopters as winds permit and the team has 19 U.S. firefighters working at Boundary Bay Backcountry Campground. Once hot spots are extinguished by bucketing, ground crews will ensure they are completely out, Parks said. 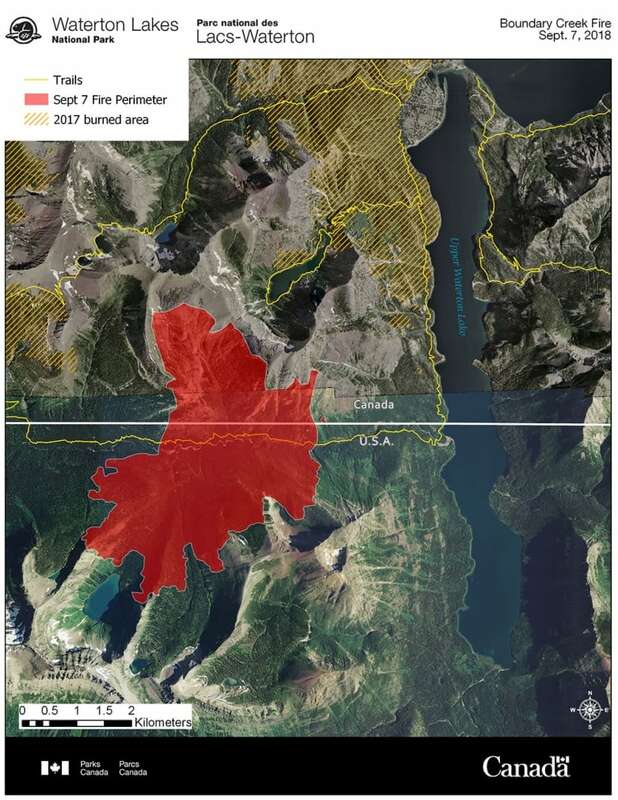 "Additional objectives include preventing wildfire from spreading south around Campbell Mountain and back into the Waterton Valley, and managing fire activity on the west perimeter to suppress smoke that could affect air operations," Stoesser said in the release. A cooler forecast over the next few days could bring some relief for crews. On Friday, fire activity increased, spreading north across the U.S.-Canada border and into Waterton Lakes National Park in southern Alberta for the first time since the fire started. It burned much of the basin on the southwest slope of Mount Richards and the south and east slopes of Mount Alderson, and travelled east 500 metres through the valley, stopping at an avalanche path. Two spot fires are also burning past the fire's east perimeter. Parks Canada and U.S. fire managers are coordinating their efforts. As a result of the fire activity, Parks Canada has closed the Bertha Lake Trail and Lakeshore Trail in Waterton Lakes National Park. The Bertha Lake and Bertha Bay backcountry campgrounds have also been closed. The fire continues to be classified as out of control. 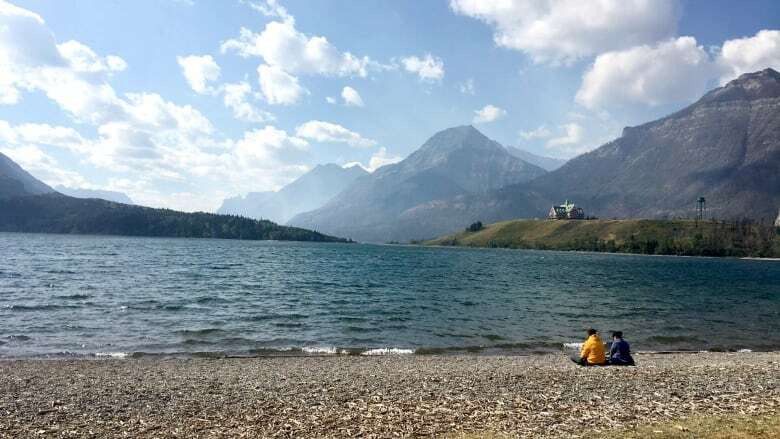 Waterton was devastated by the Kenow wildfire a year ago which consumed more than 190-square kilometres within the park — an area twice the size of Grande Prairie comprising 38 per cent of the park. About 80 per cent of the park's popular hiking trails were impacted. The fire led to a two-week mandatory evacuation and five homes outside of the park were destroyed. MORE CALGARY NEWS | 4,000 speeders were ticketed in Calgary construction zones last year. This year it's 10 times more. With files from Dave Dormer.